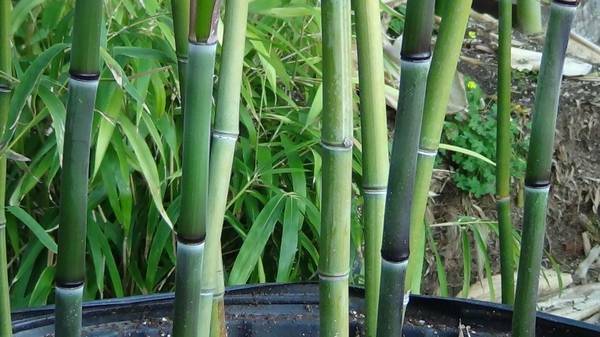 #1) Bambusa multiplex 'Alphonse Karr': A full sun bamboo with a mostly vertical growth habit. 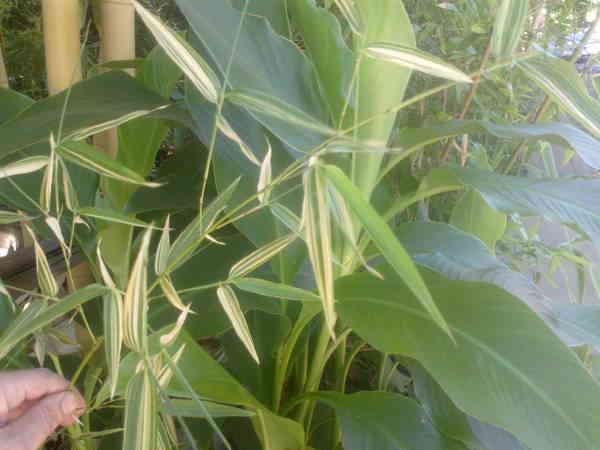 Canes are gold colored with random vertical green stripes. It typically grows to 15-20 feet tall in Northern California with canes up to about 1 inch in diameter. 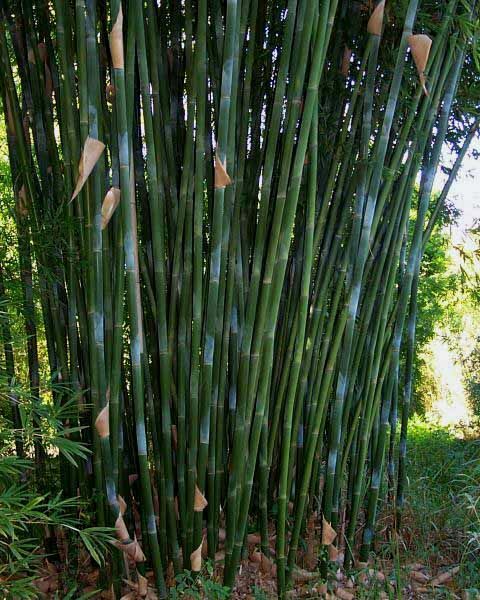 Rated to 18 °F by the American Bamboo Society. 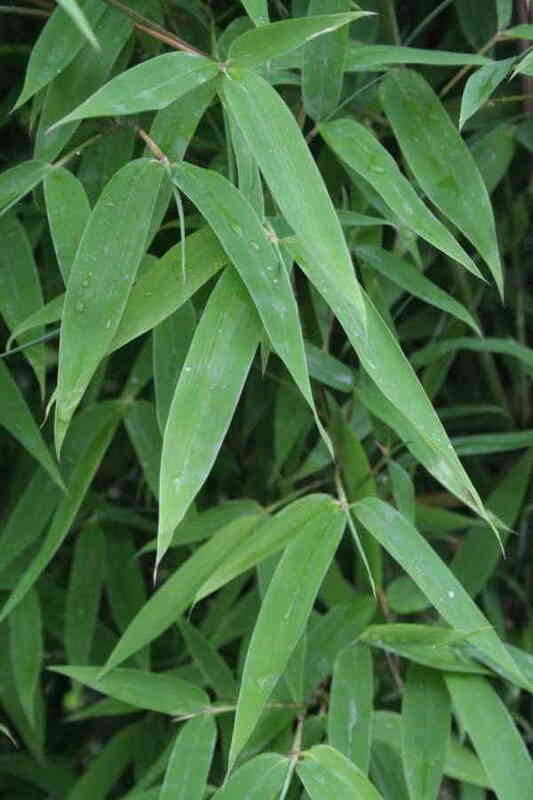 This is a common clumping bamboo used in the residential landscape. Minimum USDA Zone 8B. Select this link to find your USDA Plant Hardiness Zone 5 gallon for $75. 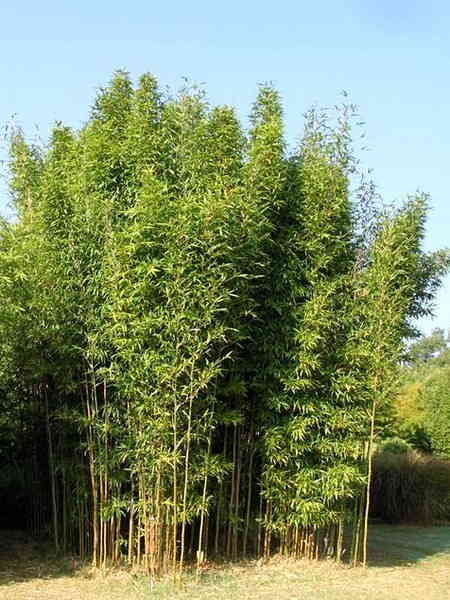 #2) Bambusa multiplex 'Midori Green': A full sun bamboo with a mostly vertical growth habit. 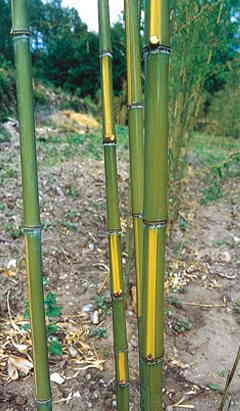 Canes are gold colored with random vertical green stripes. It typically grows to 15-20 feet tall in Northern California with canes up to about 1 inch in diameter. 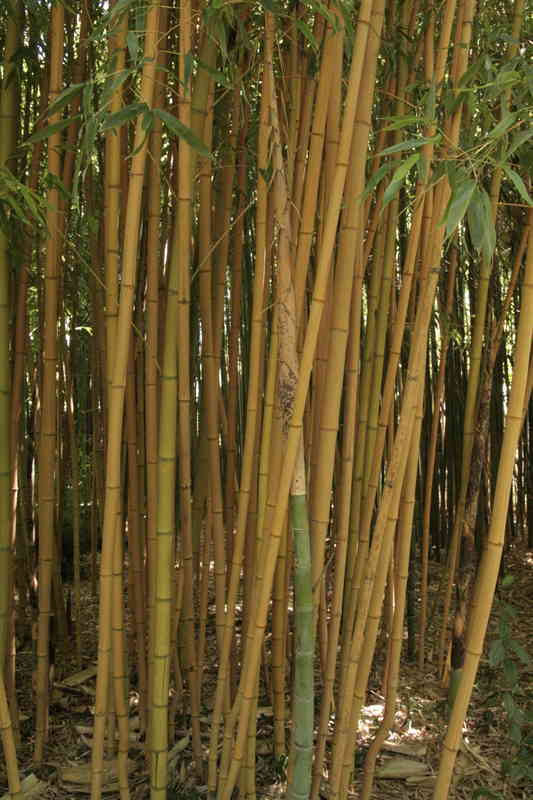 Rated to 18 °F by the American Bamboo Society. 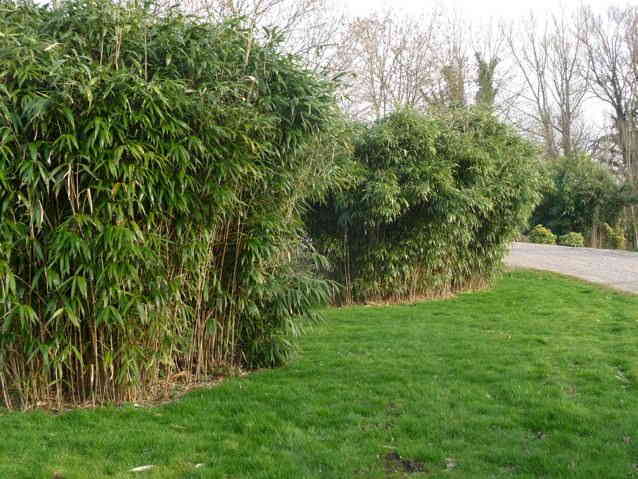 This is a common clumping bamboo used in the residential landscape. Minimum USDA Zone 8B. Select this link to find your USDA Plant Hardiness Zone 5 gallon for $90. 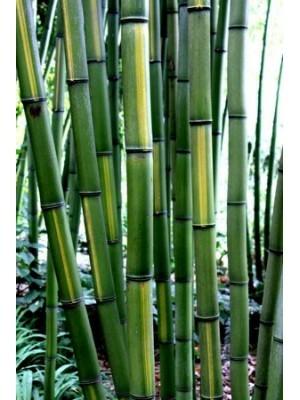 #3) Bambusa oldhamii (Giant Timber Bamboo): A full sun bamboo with a vertical growth habit. 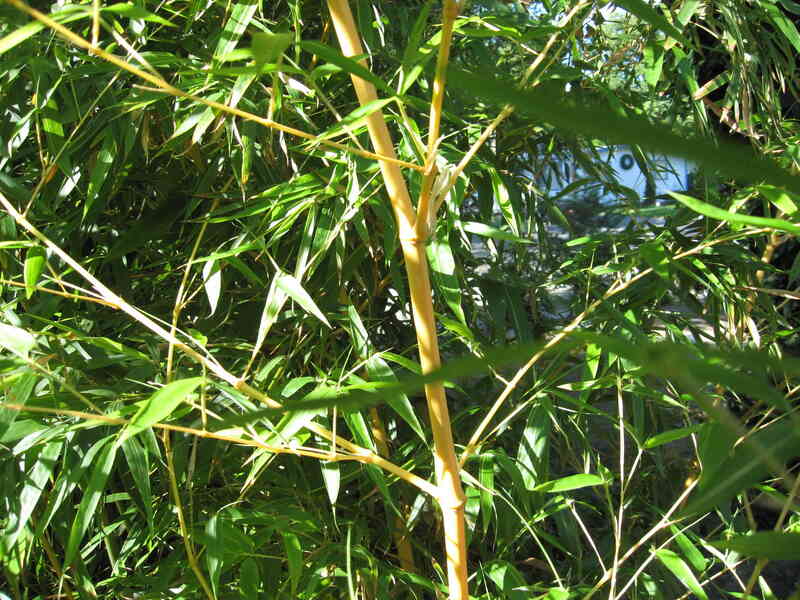 A typical height for this bamboo in the Sacramento area is 30 - 40 feet tall. In the SF Bay area it tends to grow to about 30 feet tall. 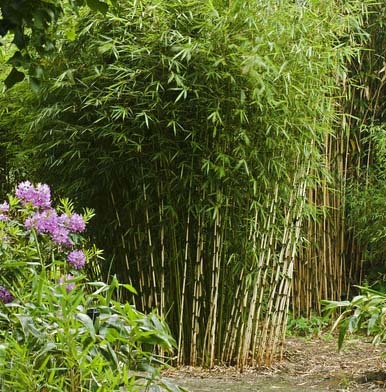 Rated to 21 °F by the American Bamboo Society. 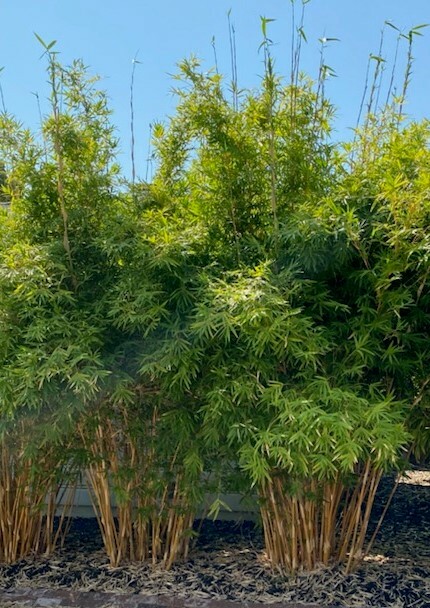 If you want a clumping bamboo with the largest diameter canes possible in Northern California this is the bamboo for you. 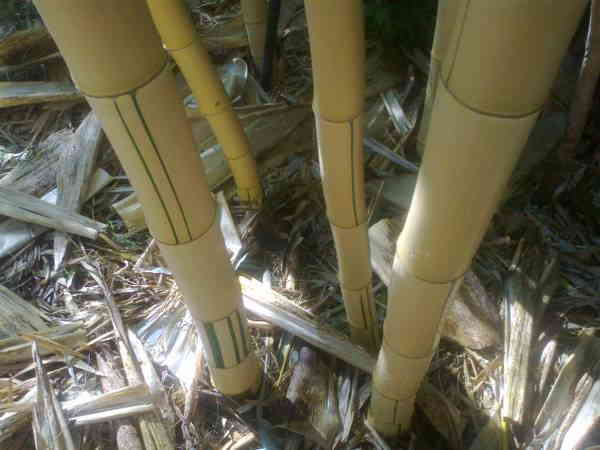 If you are considering this bamboo please also consider Bambusa textilis. 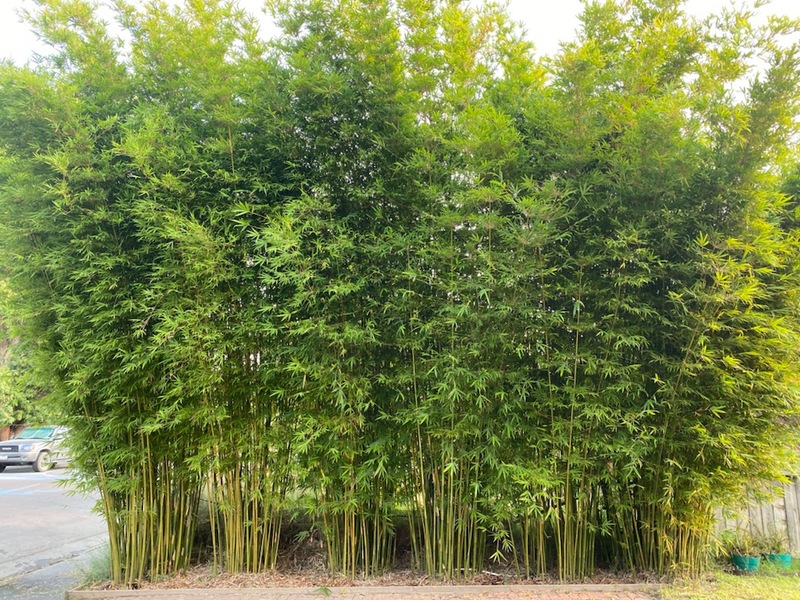 Both of these clumping timber bamboos occupy a similar niche in the residential landscape and they both grow to approximately the same height. 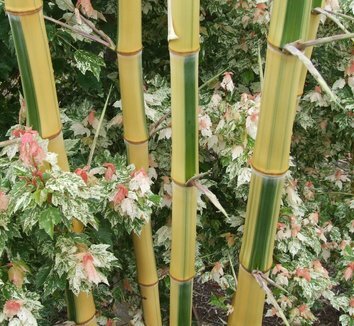 For many reasons we here at Davis Bamboo Nursery believe that Bambusa textilis is a much nicer looking and more suitable bamboo for residental plantings. 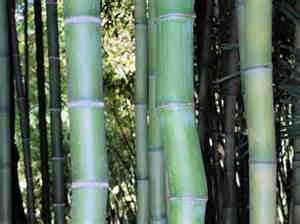 Our reasons for thinking that Bambusa textilis is generally superior to Bambusa oldhamii include that the textilis: 1) is easier to maintain (translating to lower maintenance fees over the years), 2) shows an attractive powdery blue color on the new bamboo canes, 3) is a bit more cold tolerant, and 4) it has smaller leaves that do not get torn by winter winds (because of the wind in the Sacramento area oldhamii tends to look a bit raggy for about 3 months in the late winter and early spring ~ textilis looks great all year). Minimum USDA Zone 9A. Select this link to find your USDA Plant Hardiness Zone - 5 gallon for $75. 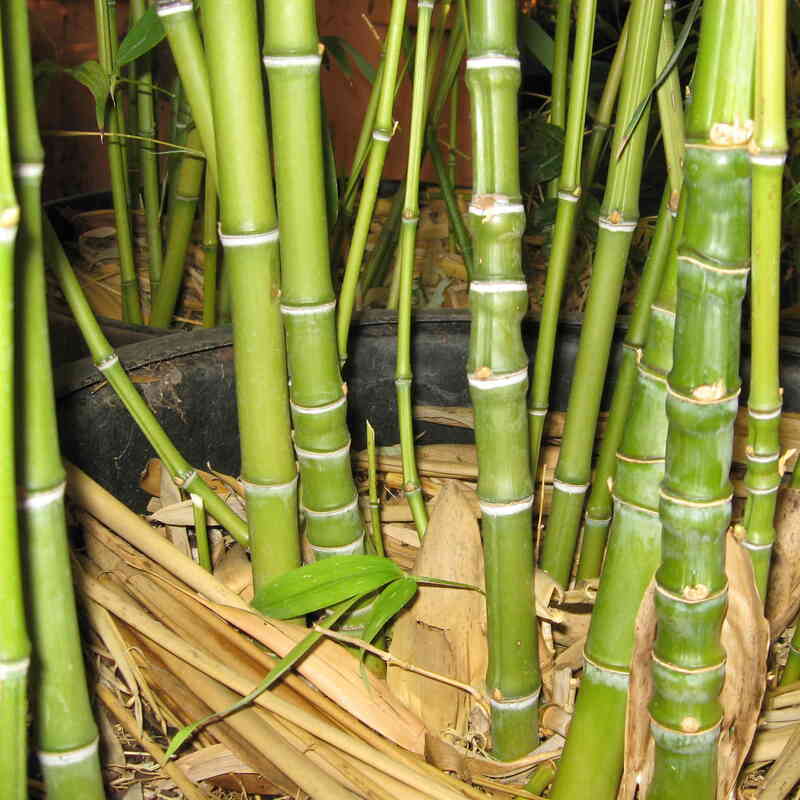 All of our bamboo plants are guaranteed free of bamboo mealybugs, ants, scale and bamboo mites. 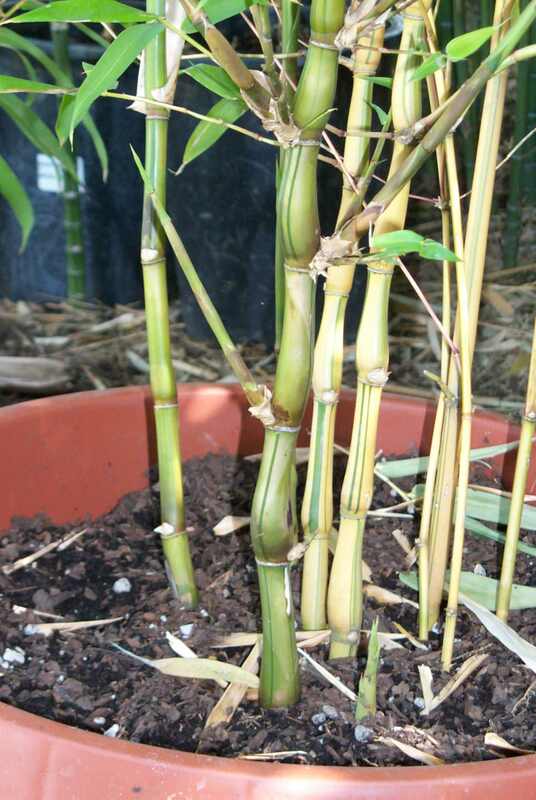 These pests are all extremely problemmatic and common in the California bamboo nursery trade. 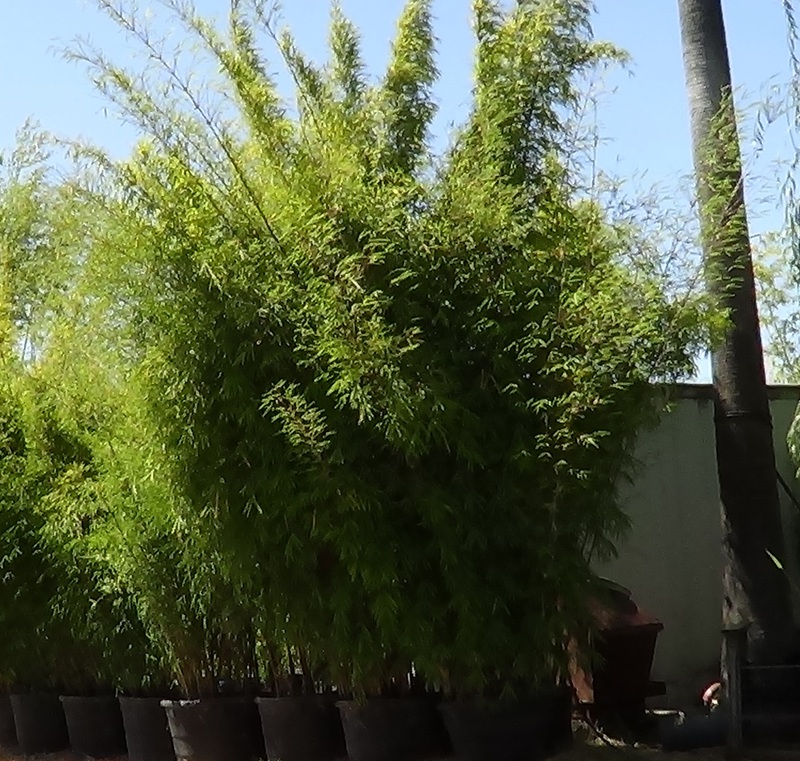 15 gallon for $225 20 gallon, 25 gallon, 45 gallon available now, plants as tall as 30' and with canes up to 3" in diameter, call for pricing. Some great deals on these larger plants are available. 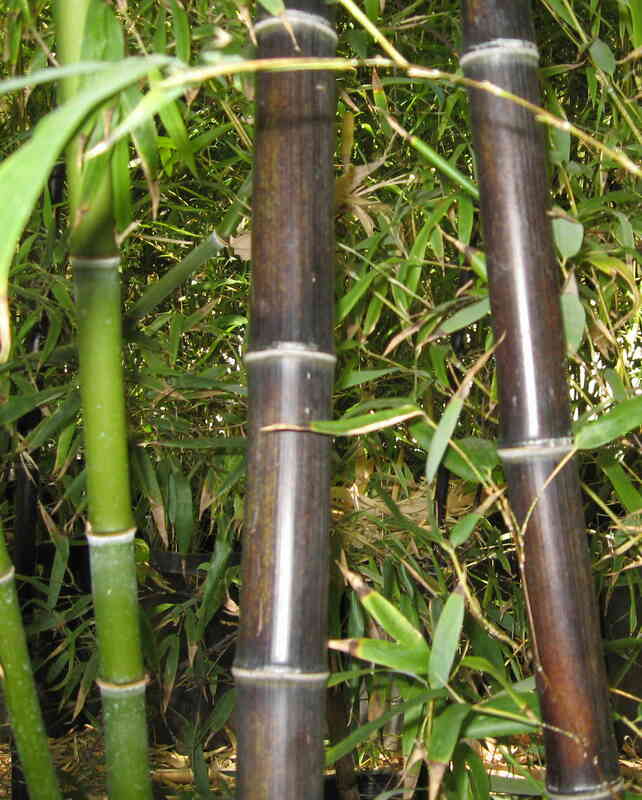 #5) Bambusa textilis 'Gracilis': A full sun bamboo with a vertical growth habit and nodding cane tops. 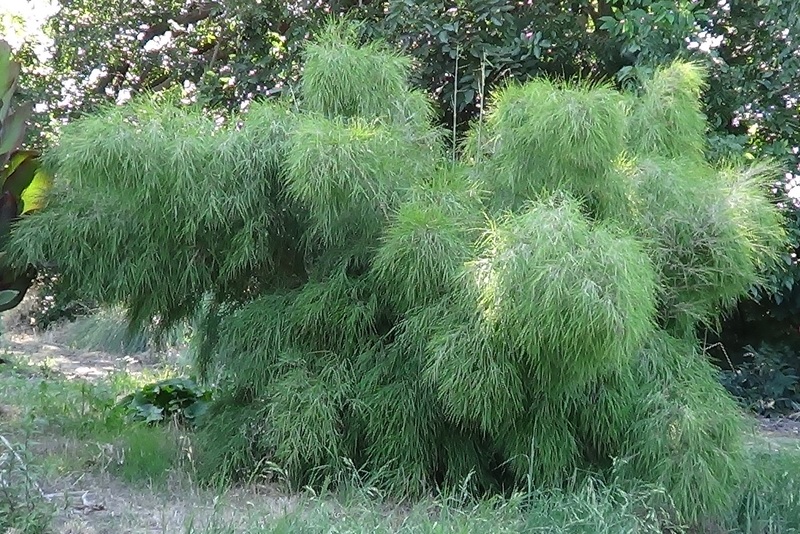 In the Sacramento Valley and the SF Bay area it usually grows 15 to 20 feet tall. 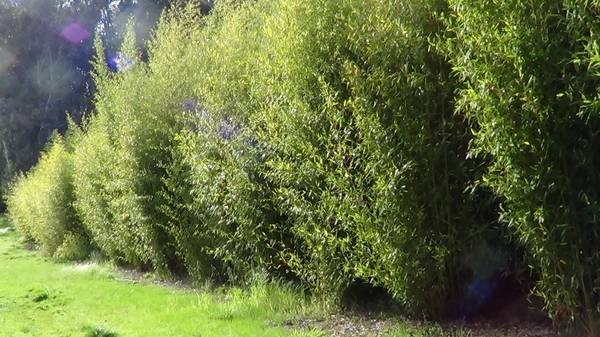 Makes an ideal privacy screen or hedge when planted on 3 foot to 6 foot centers. 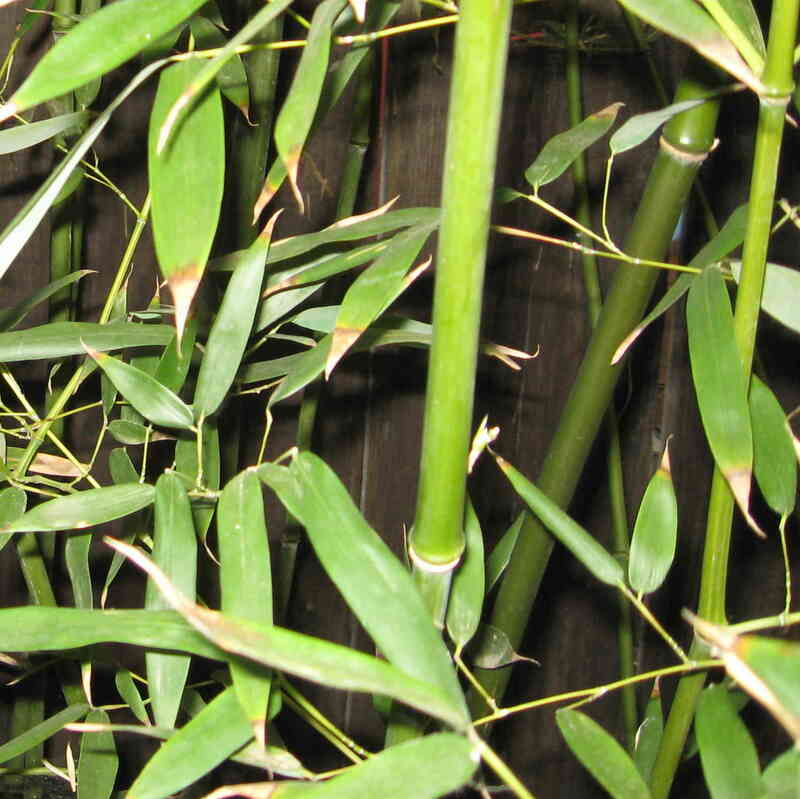 Rated to 18 °F by the American Bamboo Society. 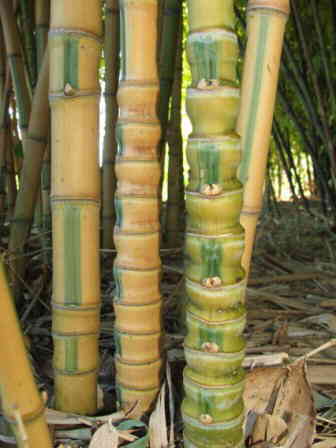 Frequently shows a powdery blue coloration on new canes. Minimum USDA Zone 8B. Select this link to find your USDA Plant Hardiness Zone . - 5 gallon for $150. 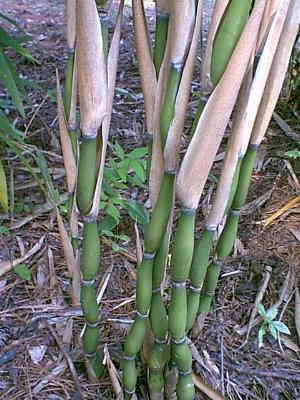 #8) Bambusa ventricosa 'Kimmei'. A full sun bamboo. Great for indoors with good sun. 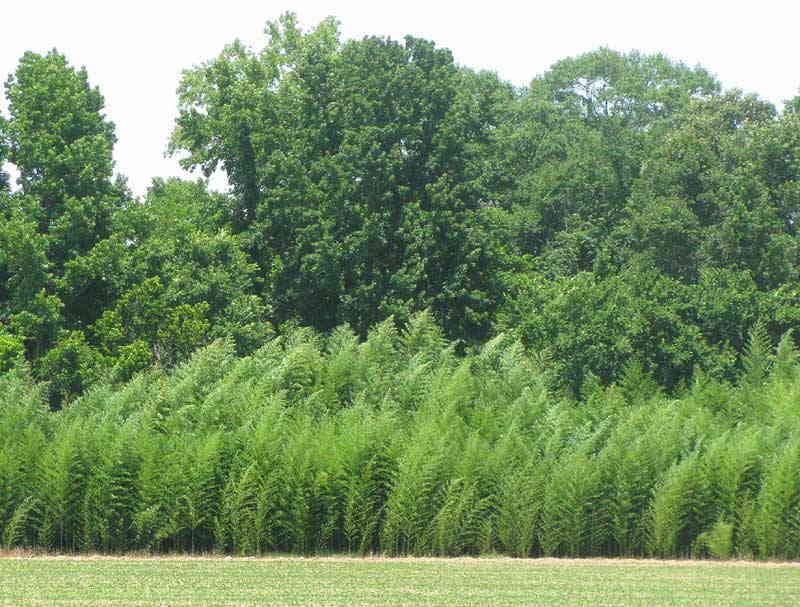 It can grow to 55 feet tall with canes up to 2.3 inches in diameter when mature. 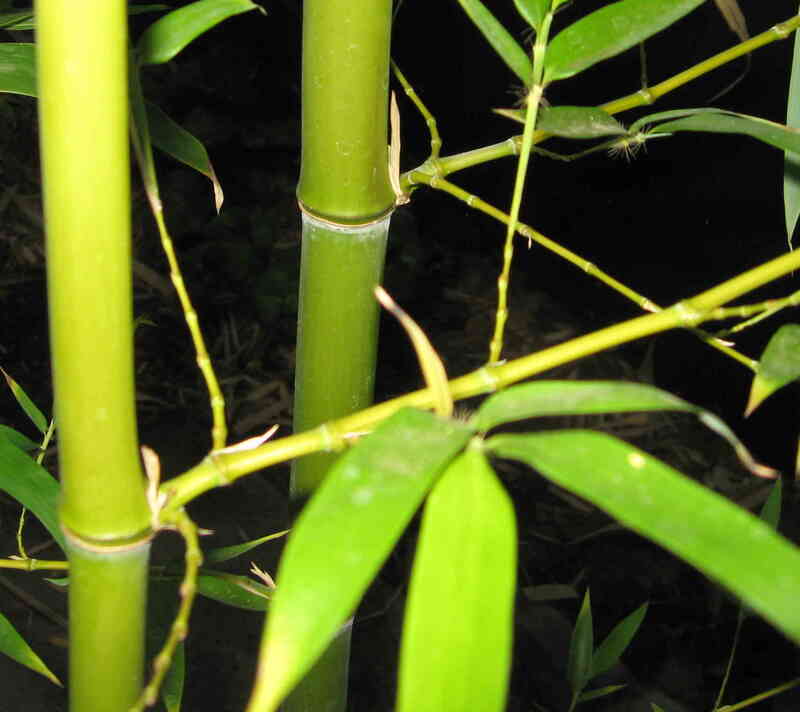 Rated to 21 °F by the American Bamboo Society. Minimum USDA Zone 9A. Select this link to find your USDA Plant Hardiness Zone - 5 gallon for $75. If you purchase 10 or more plants the price will be $55 each. 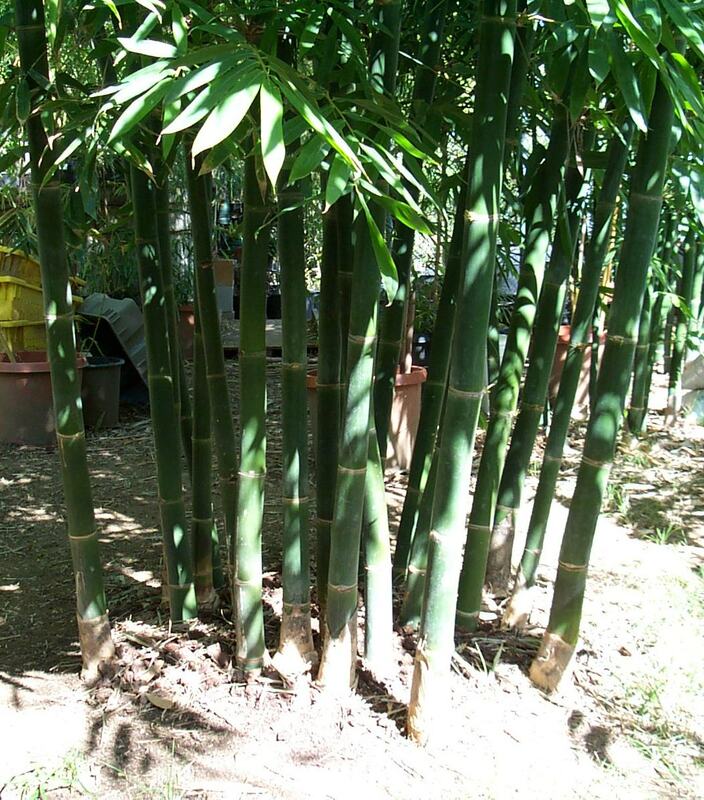 All of our bamboo plants are guaranteed free of bamboo mealybugs, ants, scale and bamboo mites. 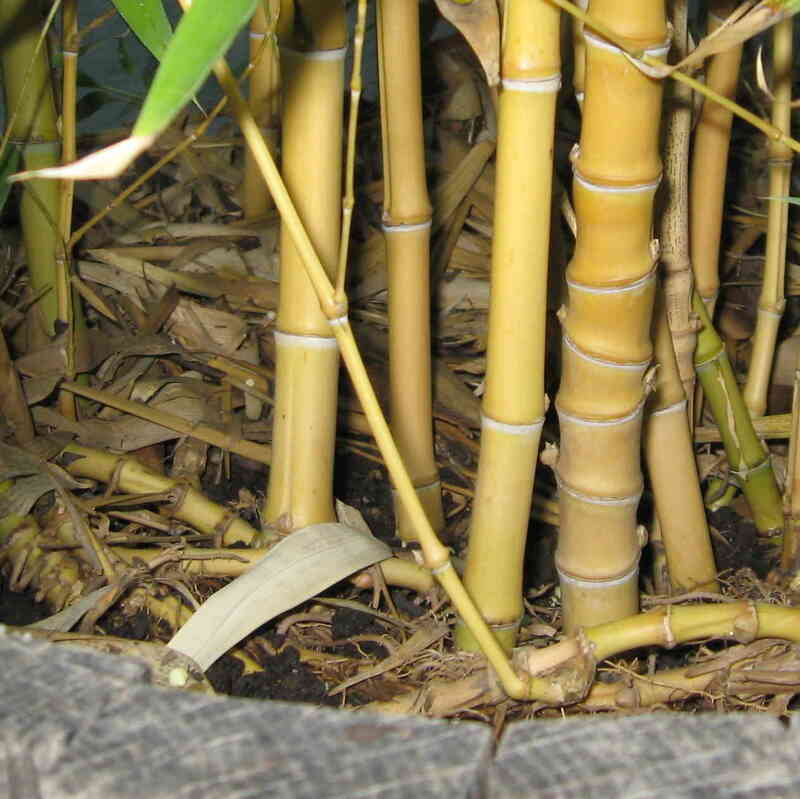 These pests are all extremely problemmatic and common in the California bamboo nursery trade. 15 gallon for $195, for a purchase of 8 or more 15 gallon the price is $165 each 25 gallon in stock, please call for pricing. 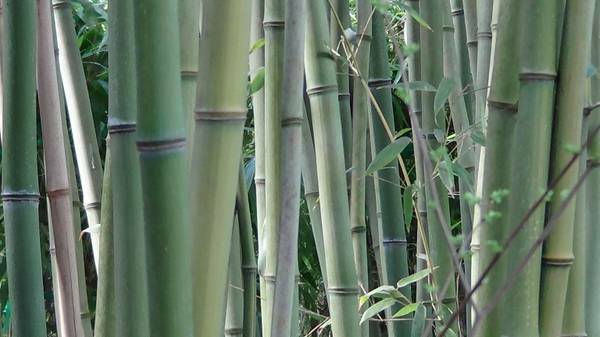 #13) Phyllostachys aurea (Golden Bamboo, Running Hedge Bamboo, Fishpole Bamboo): A full sun bamboo with a vertical growth habit. 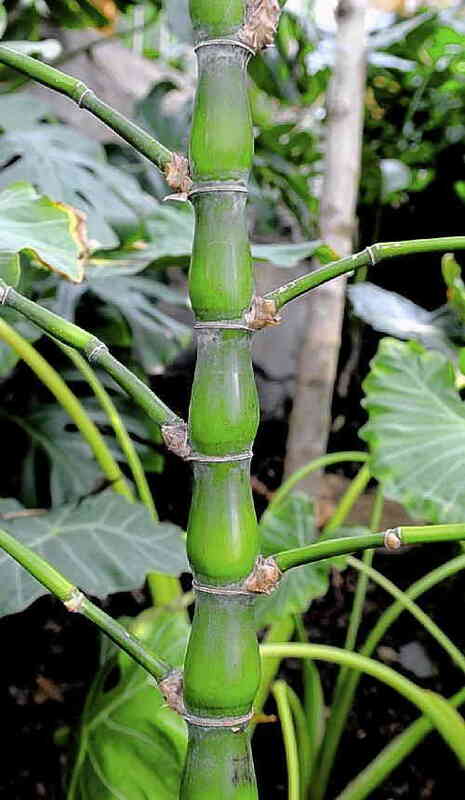 It grows to 27 feet tall with canes up to 1.8 inches in diameter when mature. 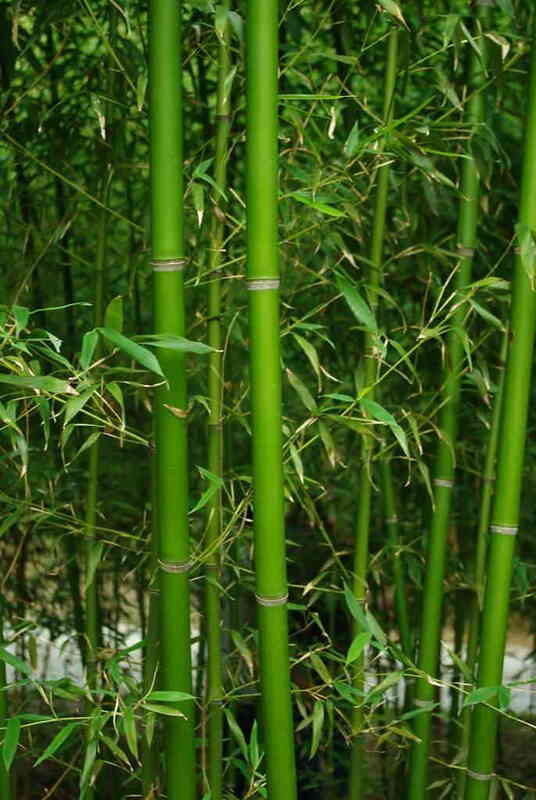 Rated to 5 °F by the American Bamboo Society. Minimum USDA Zone 7. Select this link to find your USDA Plant Hardiness Zone - $60. Many in stock. 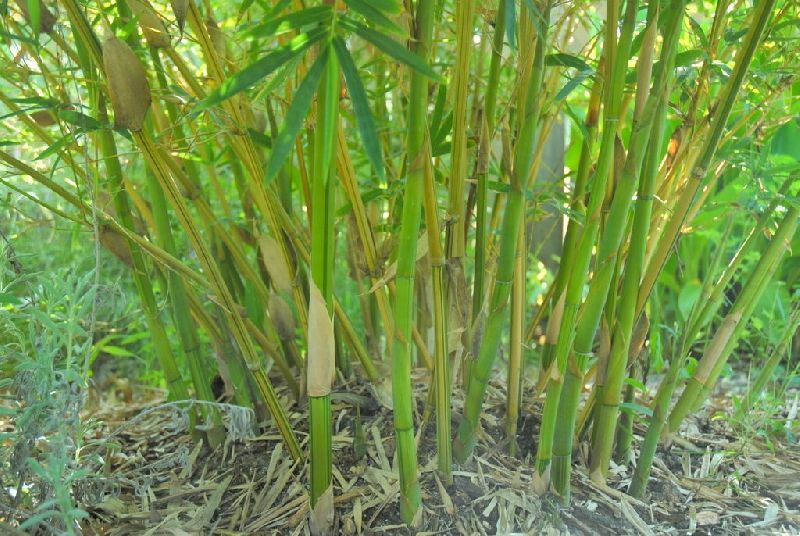 All of our bamboo plants are guaranteed free of bamboo mealybugs, ants, scale and bamboo mites. 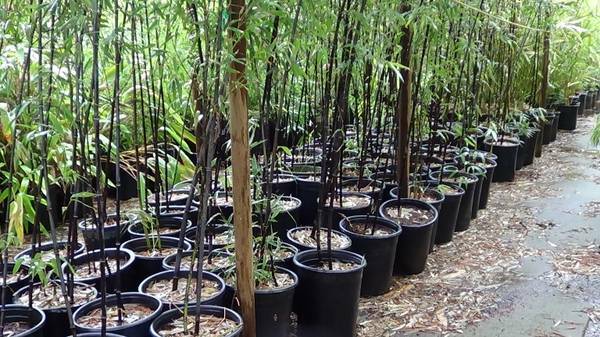 These pests are all extremely problemmatic and common in the California bamboo nursery trade. $165, many in stock. We have many 25 gallon pots and 24" planting boxes in stock. Please call for pricing information. 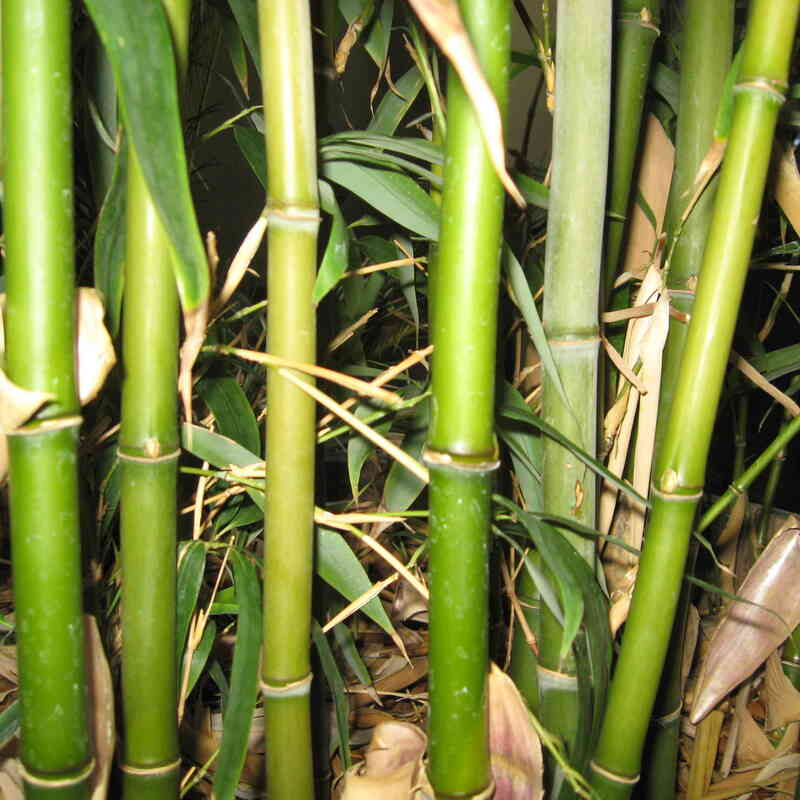 #33) Phyllostachys vivax (Vivax): A full sun bamboo with a vertical growth habit. It grows to 70 feet tall with canes up to 5 inches in diameter when mature. 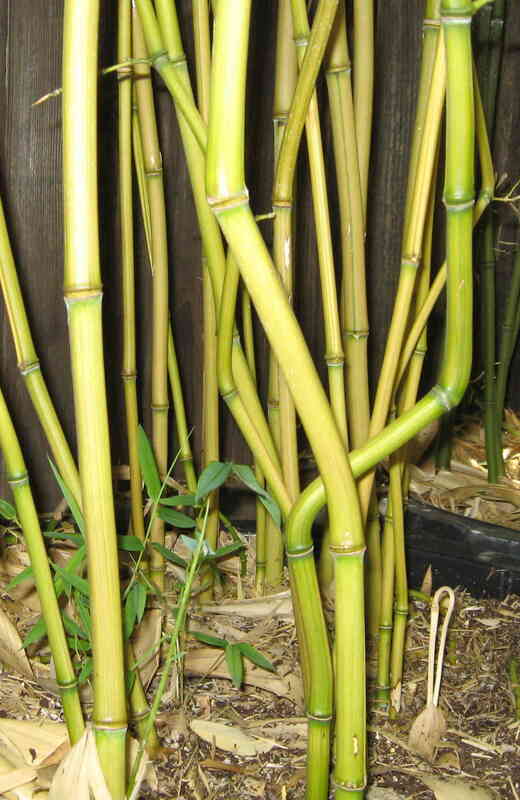 Rated to -5 °F by the American Bamboo Society. Minimum USDA Zone 6. Select this link to find your USDA Plant Hardiness Zone $75 - - We have some very large plants available in 25 , 45, and 65 gallon pots, up to 3" diameter canes and 45' tall. Please call for pricing. 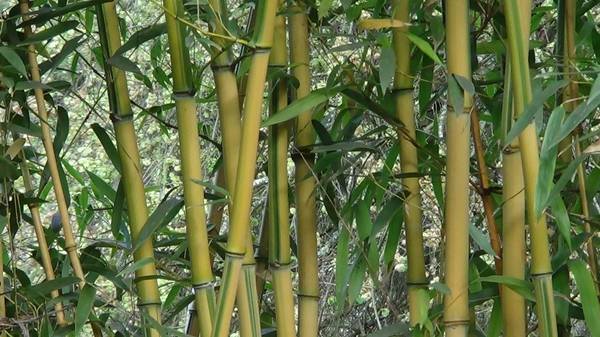 #34) Phyllostachys vivax 'Aureocaulis' (Golden Vivax): A full sun bamboo with a vertical growth habit. It grows to 70 feet tall with canes up to 5 inches in diameter when mature. 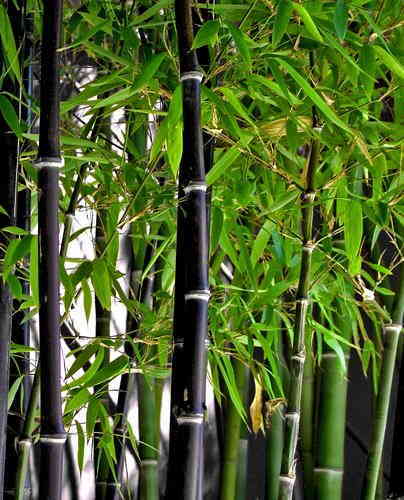 Rated to 5 °F by the American Bamboo Society. Minimum USDA Zone 6. Select this link to find your USDA Plant Hardiness Zone - 5 gallon for $75 15 gallon for $175 We have a large inventory of 25 gallon, 24", 30", 36" planting boxes in stock, canes up to 3" in diameter and 45' tall. Please call for pricing. 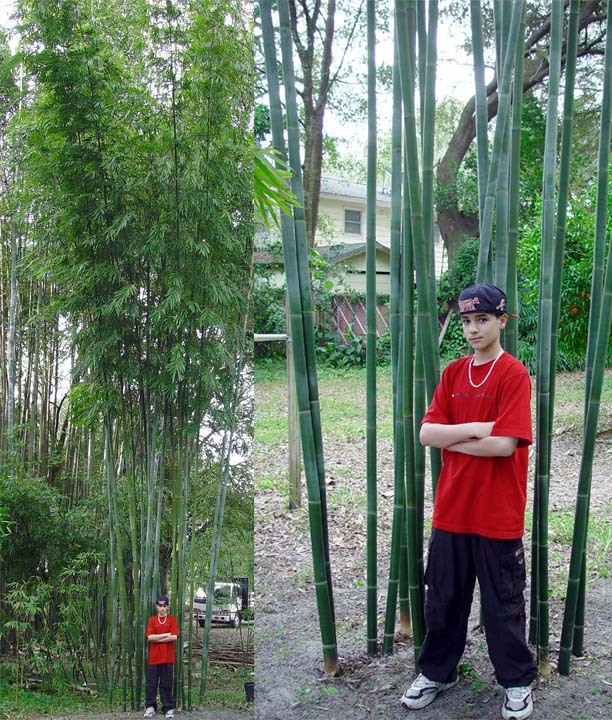 #39) Semiarundinaria fastuosa (Red Temple Bamboo): A full sun bamboo with a vertical growth habit. It grows to 30 feet tall with canes up to 1.5 inches in diameter when mature. 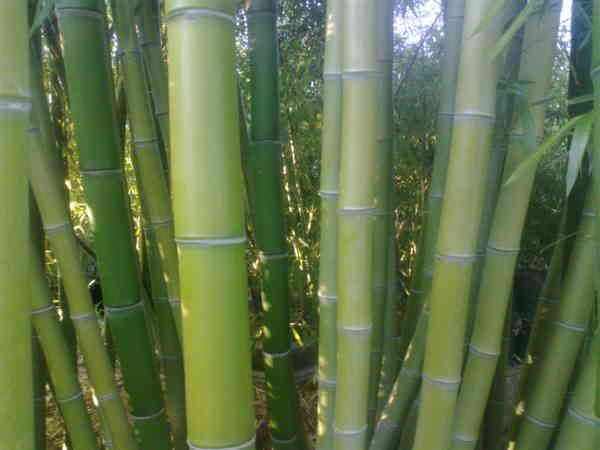 Rated to 0 °F by the American Bamboo Society. Minimum USDA Zone 6. Select this link to find your USDA Plant Hardiness Zone - 5 gallon for $75 15 gallon for $175 each many 25 gallon plants in stock, most are 15 - 18' tall. Please call for pricing.